Christmas has come and gone. Gosh, that was fast! All the toys are shipped and the ornaments are in stores. 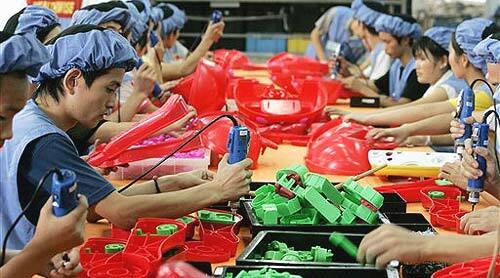 For China’s manufacturing sector the seasonal rush is over. It’s all in your mall now. That means the seasonal slowdown is underway across manufacturers in China. Many ask workers to take time off. Some slow production down from 2-3 shifts to just one. Others shift to the early production of summer gear. Just as you hang your stocking someone in China is starting to inflate swim tubes. But in another sign that China is struggling the year-on-year growth of China’s exports has been perilously low – just 2.9% over the previous year, when you compare November trade results. This is much lower than the 9-11% increase forecast. That means slowing demand in Europe and the USA is starting to take its toll. But these same economists forgot to factor in a seasonal bump. Just as Anna Wintour celebrates spring while we’re still dressed for autumn, so China factories rush to produce in September the stockings and toys we’ll want in December. So as you place that Transformer under the tree, spare a thought for Chinese manufacturers. Get out there on 26 December and start buying up Easter baskets and swim suits. The world needs its holidays and China needs the exports.